I'm one of those people that don't didn't like cilantro. Lately, its been sneaking into things I've tried and I, gulp, have really gotten a taste for it. Here's the secret: I think it is best used subtly. It really shines when it is in the background. When I've tried it in the past, so many times it has been used in too much excess and it overpowered the recipe convincing me that I didn't like it. 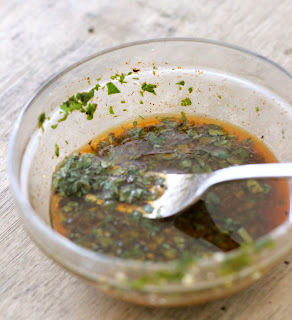 This chimichurri sauce is soooo flavorful. Mix it together without the fresh herbs, then add them just before serving. It is great as a marinade for beef or veggies or can be used as a sauce. Mix garlic, olive oil, lime juice, salt, pepper, cayenne and balsamic together. Add fresh herbs just before serving. This Chimichurri Sauce is part of my Fresh & Flavorful Father's Day Menu - get all of the recipes here! This I have made before and love! It really took the mystery out of watermelon cutting. Love your blog! I made the chimichurri sauce tonight to have with flank steak and it was delicious!! My husband especially loved it. Thanks for the recipe and inspiration.